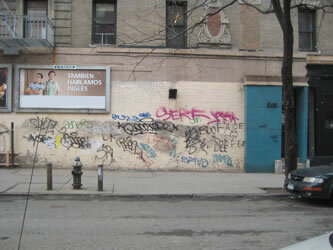 To inaugurate the re-launch of the Temporary Mural Project at Triple Candie's new location on West 148th Street, Triple Candie repainted a grafitti-covered exterior wall east of the gallery and altered an adjacent billboard. Because every detail of the wall was meticulously copied (on top of itself), the wall looked exactly the same after it was painted as it did before, the difference being that the newly painted wall was rendered all at once (over the course of several days by Triple Candie), while the existing wall had accumulated the grafitti over several months (by multiple, unrelated hands). 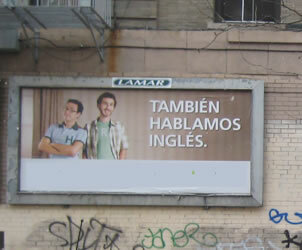 The alteration to the billboard (an H&R Block advertisement) was the removal, or covering up, of the corporate logo and contact information in the bottom register. The project was conceived of and executed by Triple Candie. 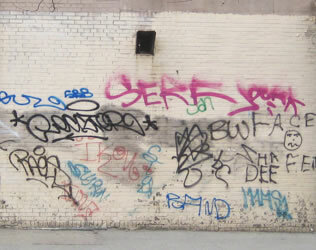 It was painted over in late March 2010. The billboard mount was removed about the same time.